As I watched the wonderful movie trailer for Stephen Chbosky's The Perks of Being a Wallflower, I noticed the great indie music playing and had to find out what it was. From this search for a song, I ended up discovering Radical Face. Radical Face is a one-man-band consisting of a talented musician named Ben Cooper. 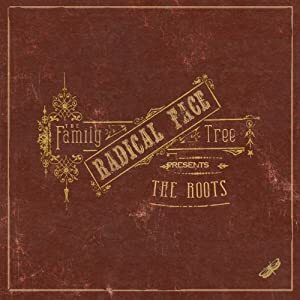 This particular album, The Family Tree: The Roots, is the first of what is said to be a trilogy of albums, and it is currently the only album of that trilogy released. The first song is more of an intro, and it is called "Names." It has a rainy background as Cooper comes in singing with his guitar ever so peacefully. Since it's so subtle, it doesn't really prepare one for the next song, "A Pound of Flesh," which is led by a pretty piano line throughout its entirety. Of course, other instruments and Cooper's voice comes in to begin the first verse, adding layers to the great song. Though one can imagine what a song called "A Pound of Flesh" would sound like, I can assure it's quality music. From Cooper's lyrics, to the music itself, to his vocals, the song is catchy and relaxing. It's the epitome of indie music, and that example doesn't just stop there, it continues in every track. "Family Portrait" follows, beginning with a choral sound and then stopping for the piano, and eventually guitar, drums, and Cooper's voice. The melody is a bit odd-sounding, almost quirky. Lyrically, the same can nearly be said, though they're more unusual than quirky. More than anything, Cooper is telling a story, which is really what this trilogy of albums is all about anyway. Still, I can't get into this particular song. The fourth track is called "Black Eyes," and unlike the other songs, it has an eerie melody to it. This seems to help demonstrate the angry lyrics in a crazier way than they might have been on any other album. Don't get the idea that the lyrics aren't well-constructed, though, for they are actually quite good. And though this song is full of rage, it isn't loud and obnoxious. Much like humans dealing with anger on a day-to-day basis. In "Severus and Stone," the pretty element found earlier in The Family Tree: The Roots returns. But it's a bittersweet sort of pretty, because it's actually a very sad song about the death of a twin brother. Honestly, I cried. Ben Cooper's lyrics paint a picture that's almost too clear, making it more like poetry than typical song lyrics which are often too vague. This song is certainly a highlight from the album and one of my personal favorites. Like a lullaby, "The Moon is Down" is a soothing, subtle (but not in a bad way) love song. Seriously, Ben Cooper might sing one to sleep while listening to this track. There's beauty in the simplicity, like with most of my favorite indie music. "Ghost Towns," the seventh track, brings a bit of a different feel than "The Moon is Down." It's more upbeat, more of a walking song than a sleeping song, but still touched by the melancholy reality of physical separation though love is still present. I enjoyed it. A distant thunderstorm can be heard in the next song, "Kin," which sounds like a rainy-Sunday song even after the rain effects are gone. There's nothing bad about this song (other than the fact that it'll be annoying when stuck in one's head at night) but it just doesn't please me as the rest of the songs do. But, a love theme returns with "The Dead Waltz." This time it's almost a dreamlike story, yet it's still so realistic. Untainted by negativity that can prevent love as described by "The Moon is Down" and "Ghost Towns." Though I like it better than the last song, it still doesn't seem to entice me as much despite the lovely lyrics. "Always Gold" is the tenth track on The Family Tree: The Roots, and probably the most likely to do well as a single. The beat of this song is clapped out, giving it a more spunky feel in the verses, but the chorus removes that vibe in order to bring the listener chills. It frustrates me that I can't really explain why this song is as great as it is, so just go listen to it. Go listen to this entire album. Cooper saved an amazing song for last on this album, and that song is called "Mountains." I am at a loss for words for this song. Truthfully, it's hard for me to describe any of these songs, and it's quite obvious since this review is so poorly written in its repetitiveness. All I can seem to say is this: It's amazing how well Radical Face describes life. I don't think I've ever heard it described so well until now, and this goes for both the music and lyrics. Life isn't a black-and-white subject, it is a grey area. Things aren't just sad or just happy, but often bittersweet, since life comes with a magical combination of positives and negatives that balance each other out. But then again, this doesn't go for just "Mountains," it goes for the whole album. On a more specific note, "Mountains" is about a boy who lost his mother and is assured that she's still there watching over him. Each night he has a hope of seeing her once more, and it almost feels like everything is okay. The piano is beautiful, as usual, and Cooper's voice is calming, as usual. But there's something about the semblance of it all, the way in which the message is carried out, the way in which it was written. This is one of those albums I can't help but reccommend to anyone and everyone.